I thought I knew how to make challah. After all, I have been making challah almost every Friday, without fail, for over 10 years — even going so far as to write a book about my journey that was published this past September. I use the same recipe that my friend Abby shared with me so long ago. Since I wasn’t a baker beforehand, I haven’t felt comfortable deviating from this recipe. Over time, I wrapped some special moments around the experience each Friday. For example, I now make the challah with intention, purposefully thinking about someone in whose merit this week’s batch will be made for. However, I have remained uncomfortable about changing how I actually make the dough. Until recently. 1. Plain is…well, just plain. I make plain challah. It’s simple, easy, and delicious. Making challah is about slowing down for me, being present in the moment at the kitchen counter. Stopping and being mindful has been a challenge of mine, especially as a busy mom and physician. When my hands are in a bowl of dough, it’s awfully difficult to also be checking my phone or putting away the groceries. Therefore, making plain challah made sense to me: keep it simple. I have learned as I make challah with others of a whole new world: a world filled with flavored challahs. Imagine, olive and za’atar challah, or blueberry challah. My parents used to say that “traveling is broadening,” and now I know why! 2. The dough can be made ahead of time. I used to only make challah on Fridays, in time for our family dinner that evening. But sometimes it’s challenging to get it all done. Sometimes, like those Fridays when I had too many meetings, or the clinic ran late, I feel rushed. Sometimes, I am pulling the baked challahs from the oven moments before we all gather. Why I had been unwilling to experiment, to deviate from the recipe just a bit? Maybe I could have made it earlier in the week, and simply warmed it up in the oven on Friday before Shabbat dinner. I realized I had been afraid to try something new — I was afraid it might not work. Fellow challah bakers have offered some helpful suggestions: I could make the dough a day in advance, and let it rise in the refrigerator to be braided and baked on Friday. I could actually go so far as to make the dough, let it rise, and braid the dough on Thursday, and place it in the refrigerator overnight to bake on Friday. Or, I could even bake the challah in a large batch ahead of time, freeze it, and reheat it just before dinner. Now, I really see the merit looking ahead. After all, things come up. I can foresee being caught unaware, not being able to make challah as planned. These options allow for greater flexibility, something all of us could benefit from. 3. Making challah is a great way to destress and be kind. Stress can make us sick, and when we’re sick, stress can make our sickness worse. Tactile behaviors — doing things with our hands, like knitting or baking challah — is a great way to manage stress and have been shown to improve our moods. I find that kneading challah dough is an excellent way to handle my stress — my favorite part is when I unceremoniously dump it on the counter and begin to knead it into a ball. I always make the dough in a bowl first, mixing it with a spoon, and then knead the dough with my hands, as opposed to using a mixer. I want to feel it, and in doing so, I reap the rewards of decreasing my stress. Since I started making challah with other women, however, I’ve learned that I don’t have to wait until the dough is on the counter to get my hands in it. 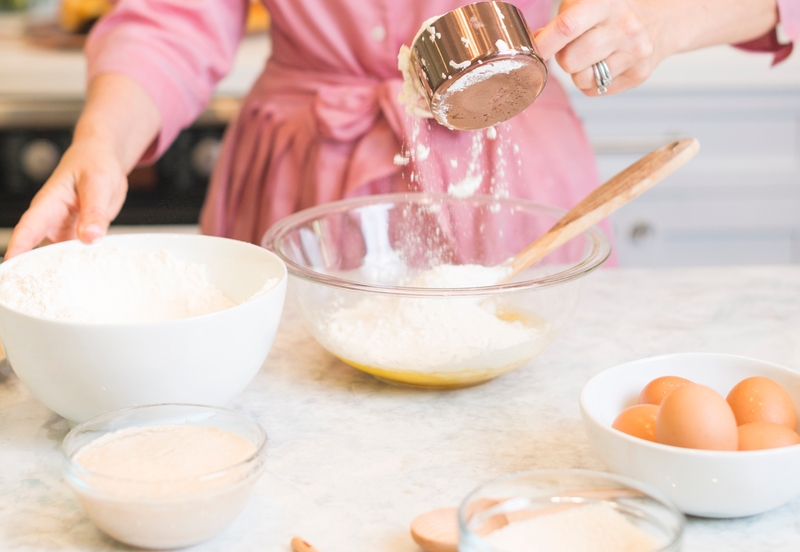 I’ve seen women mix the dough right in the bowl with their bare hands — getting that extra tactile time — and then go on to knead it on the counter. They don’t even wait! 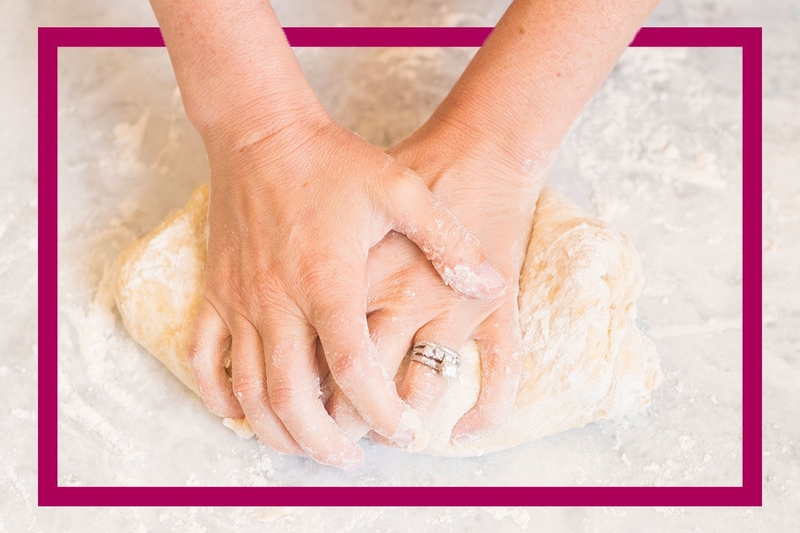 But making challah isn’t just about self care — it’s also a great way to help others. I typically bake enough challah to feed those at the table. Sometimes, if my kids are bringing friends over, for example, I’ll double the batch. I don’t usually plan for leftover challah; and if there happens to be some left, it usually gets made into impromptu challah french toast in the morning. I have recently met challah bakers who purposely make extra challah. Why? They share it! I love this. Some share it with people in their circle who need a little extra love that week; maybe someone who is ill or recently suffered a setback. Some make it to share with others —whom they likely don’t know — who are hungry that week. Our temple has a chesed committee that helps those in need, for example, and shares challah this way. On college campuses, Challah for Hunger is another way to share challah. And I’ve met people on my book tour who have come together in groups to make challah.